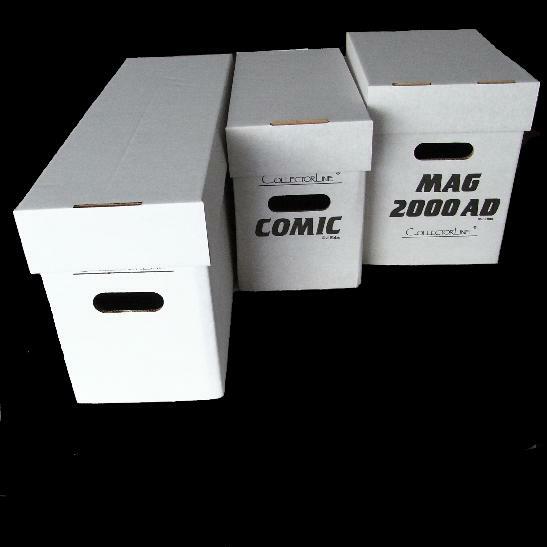 Holds 220 2000AD sized publications with backers, 250 without backers. White finish high gauge card and double walled construction for strength. Double layer bottom for weight support and overall structural integrity, which makes them stackable. Secure carrying handles. We only ship this item within the UK, sorry! Also, please note, shipping is stupidly expensive (£12-00) to the point where it is probably not worth it. Basically one dimension of the box when packed flat is about 10cm too long for any sensible priced shipping category so it is a fortune. Sorry, but there is nothing we can do about it, that is what we get charged.